U.S. cheese consumption is at an all-time high. The U.S. Department of Agriculture Economic Research Service reported that in 2016, per capita consumption of natural and processed cheese varieties reached 43.6 pounds. Of that, 36.6 pounds was natural cheese, representing an increase of 12.1% since 2006. The remainder—6.97 pounds—is processed cheeses, which encompasses many varied products, and has been a fluctuating number over the 10-year period. 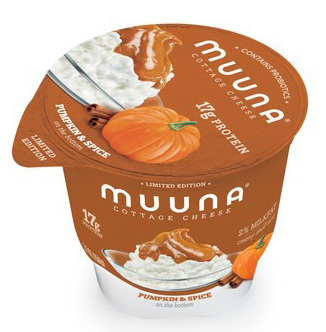 Muuna, for example, continues to reimagine the category with its rollout of the first-ever Pumpkin & Spice cottage cheese. This individually portioned product blends real pumpkin puree, pumpkin spice seasoning, and creamy, protein-packed cottage cheese, conjuring the flavor of pumpkin cheesecake. Part of the new product’s marketing message is that it’s a guilt-free way to enjoy the seasonal flavor. For instance, one medium pumpkin spice latte averages approximately 50 grams of sugar and little to no protein whereas a 5.3-ounce snack cup of Muuna’s new Pumpkin & Spice flavor has only 8 grams of sugar plus a whopping 17 grams of protein, and even contains probiotics and potassium. America’s love affair with cheese is both deepening and evolving, according to David Sprinkle, research director at Packaged Facts. Packaged Facts forecasts innovation will continue to maximize the experience of eating cheese with unique takes on flavor and indulgence, craftsmanship and authenticity, and health and nutrition. I agree. Below are some recent innovations to inspire cheesy innovation. But first, have you heard about how South Dakota is disrupting the dairy industry, namely in cheese manufacturing? To learn more, link HERE to an article I wrote recently wrote for Food Business News after attending a media tour showcasing South Dakota’s investment in growing its cheese production. Something to note is how Valley Queen encourages innovation with its customers, which is possible through its use of open drain tables. 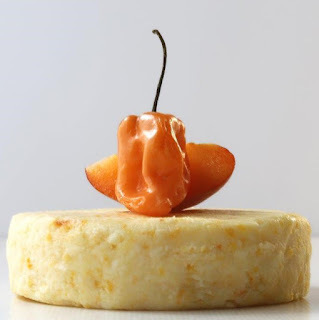 Speaking of flavors, The Mozzarella Company is rolling out Dolce Habanero, which is made by mixing sweet apricots and firey habanero chiles into cows milk curds and then pressed into round discs. Dolce Habanero delivers its unique characteristics perfectly timed to tantalize the palate with every bite. First there’s a creamy sensation, then a pleasant sweetness and finally exiting fire. Saputo’s Frigo Cheese Heads is all about flavor exploration. 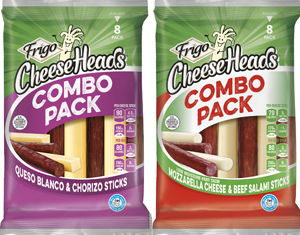 The company has two new cheese and meat combo snack packs: Queso Blanco with Chorizo and Mozzarella with Salami. Specialty deli meats have continued to show growth year-over year, with 65% of shoppers seeking meat snacks that include spicy flavors and broader ethnic appeal, according to the company. This combination of meat and cheese is booming, and is especially appealing to low-carb, high-protein dieters. Cheesewich, the original player in the breadless cheese and meat sandwich space, is growing its hand-held combo line with two all-natural options and two halal-certified products. They are: Uncured Genoa Salami & Colby Jack, Uncured Pepperoni & Mozzarella, Halal Beef Salami & Colby Jack and Halal Beef Salami & Mozzarella. 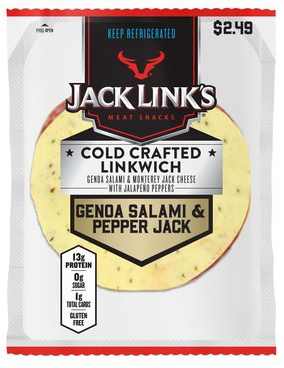 Meat snack marketer Jack Link’s recognizes the meat and cheese snacking space as an opportunity and is rolling out Cold Crafted Linkwich. Made with premium cured meats and real Wisconsin cheese, each Linkwich provides 15 grams of protein and only 1 gram of carbohydrates. 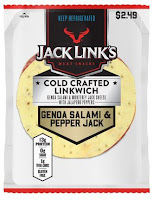 The launch includes three varieties: Colby Jack & Hard Salami, Pepper Jack & Genoa Salami and Cheddar & Hard Salami. Dried 100% cheese snacks are also designed for the low-carb dieter. These cheese snacks come in many forms, shapes and flavors. To read “New cheese snacks feature the crunch carb-avoiders crave” in Food Business News, link HERE. 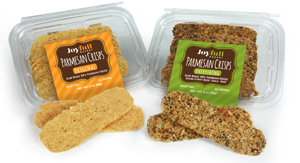 Some recent introductions in this space include Joyfull Bakery’s Parmesan Crisps, a line of slow-baked 100% parmesan cheese. Available in two varieties—Everything (sesame and poppy seeds, onions and garlic and Original—the crisps are gluten and wheat free, low carb and packed with protein. The 3-ounce containers are intended to be merchandised in the deli or bakery department. NutraDried Food Company has its new Moon Cheese Toppers. 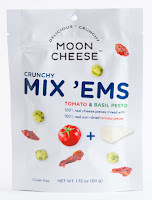 Using patented technologies, the company removes only the moisture from cheese while keeping all the nutrition and flavor to make Moon Cheese snacks. 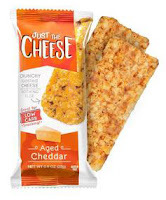 The company is now flavoring that cheese and offering it in smaller pieces than the snack version. Crunchy Moon Cheese Toppers are positioned as a high-protein, flavorful garnish for soup, salad and other meals. Varieties are: Bacon Spiced, Italian Herb and Parmesan. A 2-ounce bag contains 4.5 servings, with a serving being 22 to 26 pieces. One serving contains 70 calories, and 5 grams of both fat and protein. It’s carbohydrate and gluten free, while being an excellent source of calcium. 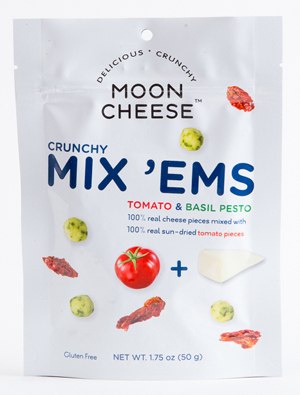 The company also offers Moon Cheese Mix-Ems. This crunchy snack is a unique tomato and basil pesto seasoning blend with 100% real cheese and sun-dried tomato pieces. The Specialty Cheese Company now offers Just the Cheese Bars in Aged Cheddar, Buttery Grilled Cheese and Fiery Jalapenos varieties. A single-serving pack (22 grams) contains two bars and provides as much protein (8 grams) and calcium as a glass of milk, according to the company. Made with 100% all-natural Wisconsin cheese, a serving is 150 calories and contains 12 grams of fat and less than 1 gram of carbohydrates, making it very attractive to keto dieters. Cheese and snacking just make sense, as cheese can be both a treat and protein nourishment. And that’s what Americans are looking for in snacks. Half of Americans say they snack to treat themselves, while others snack to fuel their day or take a quick break, according to Mintel research. Bel Brands is all about snacking. One of the company’s newest products is The Laughing Cow Cheese Cups, which features the same The Laughing Cow cheese taste but now available in a portable, dunkable cup to enjoy whenever, wherever and however. 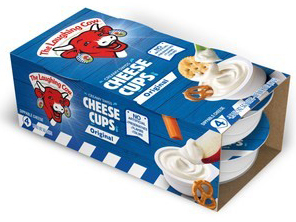 The new cups join the classic The Laughing Cow Cheese Wedges and Cheese Dippers. Made from real cheese with no artificial colors, preservatives or artificial flavors. The cups come in Creamy Swiss Original, Creamy Swiss Garlic & Herb and Creamy White Cheddar varieties. Under its Babybel brand is new Babybel Cheese & Crackers. The snack pack combo comes in three varieties. They are: Original with mini butter crackers, White Cheddar with mini butter crackers and Light with mini whole grain wheat crackers. They come in one-count and three-count packs. 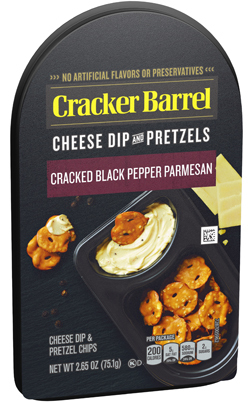 Kraft Heinz is making its premium cheese brand Cracker Barrel into a dippable format. New Cracker Barrel Dippers are adult-centric snack packs. The single-serve packs come in four varieties: Cracked Black Pepper Parmesan Dip and Pretzels, Garlic and Herb Jack Cheese Dip and Crackers, Jalapeno Jack Cheese Dip and Crackers, and Sharp Cheddar and Pretzels. Red Clay Gourmet is introducing the Dip ‘N Devour Snack Pack, which features the company’s award-winning batch-mixed, hand-packed pimiento cheese spread along with La Panzanella Mini Croccantini Artisan Crackers. The pimiento cheese spread varieties are: Sharp Cheddar, Hickory Smoked Cheddar, Flame-Roasted Jalapeno and Sriracha. The North Carolina husband-and-wife owned company uses locally sourced ingredients, when possible, to produce its unique version of this southern treat. For example, they source North Carolina-grown jalapeños and banana peppers. They are roasted and processed by hand. The non-GMO, cage-free egg mayonnaise is handmade weekly and used sparingly. When it comes to telling a story about cheese, Dorothy’s has one to tell. Owned by Savencia Fromage Dairy, the new line of Dorothy’s branded cheeses has a story that dates back to the 1930s, when young Dorothy Kolb fell in love with the cows at her grandfather’s Illinois creamery, which grew into Kolb-Lena, the first European-style cheesery in the Midwest. After Kolb became the first woman to earn a degree in dairy science at Iowa State University in Ames, she married a fellow cheese-aficionado--Jim Demeter-- and together they reinvented her family business. Now some 50 years later, Dorothy’s family and the Kolb-Lena plant are behind two new cheeses crafted in her honor. 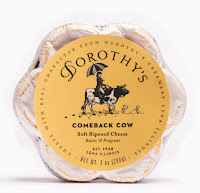 Dorothy’s Comeback Cow is a bloomy rind cheese with rustic, fragrant notes and tinged orange with age. Dorothy’s Keep Dreaming is a soft-ripened cheese with creamy notes and a robust flavor. 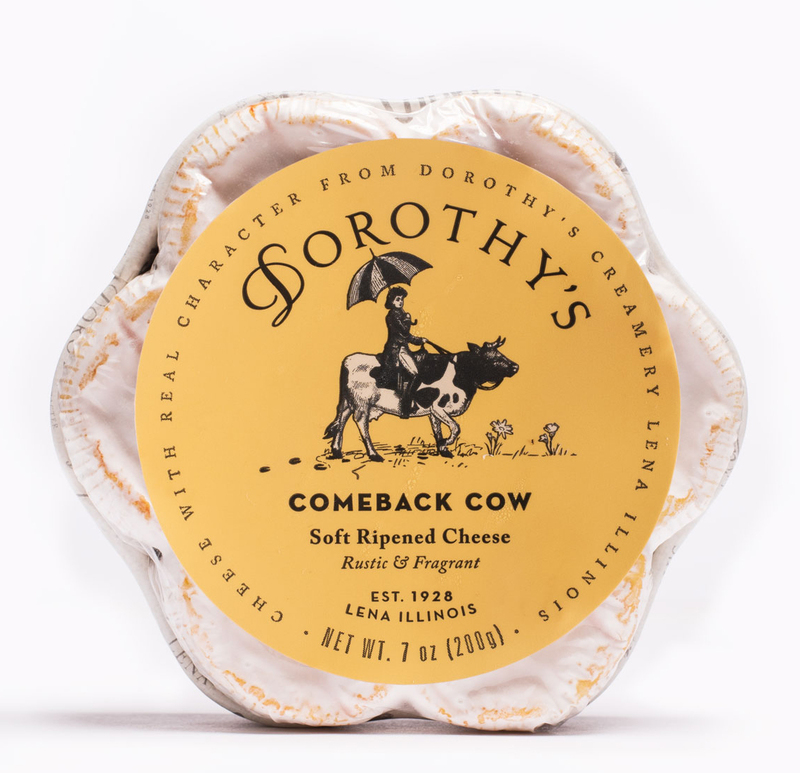 Featuring artificial hormone-free local cows milk and proprietary cultures, Dorothy’s cheeses uphold a respect for the cheesemaking process, including hand-on efforts such as dipping, coating and wrapping.